Firefighters battled a fire at a metal recycling center in Oakland's Jack London Square Friday afternoon. Anser Hassan reports. Firefighters battled a fire at a metal recycling center in Oakland's Jack London Square Friday afternoon. Four engines and two fire trucks battled the recycling pile fire at Schnitzer Steel at 1101 Embarcedro West, with the help of the city of Alameda's fire boat. The fire sparked around 4 p.m. near the port of Oakland due to residue left on one of the used parts of a car. "Sometimes, not all the metal is completely cleaned, so it has some residue, even though they do their very best to clean it and that residue sometimes ignites," said Oakland Fire Department Battalion Chief Tracey Chin. Scrap metal, such as old cars, are shredded and recycled at Schnitzel and during production, residue caught fire on the conveyer belt and quickly spread. Though the fire only burned about half an acre and it did not spread, black smoke could be seen as far down as Fremont. "Some of that could possibly have some materials that are not great for your health to inhale," said Chin. The location also proved to be challenging for the fire crews due to lack of water. "These are the last hydrants on this grid, so that poses its own set of issues as far as the volume of water and pressure that came be down in this area," said Chin. No injuries have been reported, though there have been some concerns over the toxicity of the smoke given the type of metals and other materials in the fire. 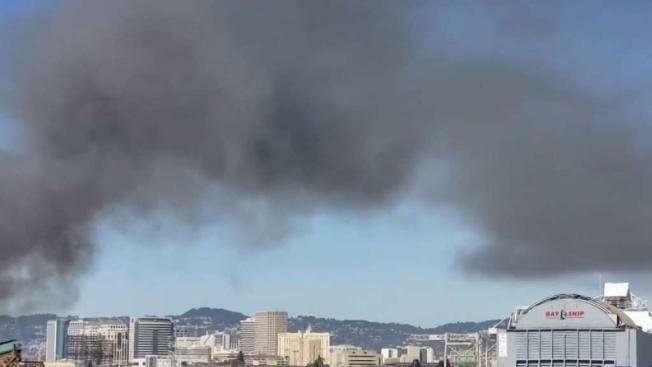 "Right now for us the primary concerns with the air quality is migrating this incident," said Oakland Fire Department Battalion Chief James Brown. This is not the first time this location raises concern over air quality, there have been several fires in the area over the past year, March being the latest. "This is something we are gravely aware of," Chin said. Adam Simons, a spokesperson for Schnitzel, refused to comment on past fires but insists that there was not an unsafe amount of material at Oakland site and that employees followed new protocols recently implemented as an outcome of the previous fires. "Again, we are going through an internal investigation to make sure that everything that has moved through our machines is up to code because, that is our protocol," Simons said. The Bay Area Air Quality Management District continues monitoring the air quality levels in the area.